Today, and, really, for a few decades now, having an automatic transmission is the boring option. But it’s important to remember that this wasn’t always the case. There was a time when automatic transmissions weren’t just exciting for technological reasons, but because there was some real drama to the whole process. If that doesn’t make any sense to you, then you clearly haven’t seen the Electric Hand in action. Just to be clear, what you’re seeing up there is a little unusual, in that normally in your Electric Hand-equipped car you’d have unscrewed your gear shift lever and stuck it up under the dashboard on some handy little clips provided just for that purpose. This would allow for the three-across, legs-unimpeded seating so championed by Hudson’s advertising. Of course, if you did keep the shift lever in place, you’d be treated to this wonderful ghost-shifting display, which I’m pretty sure would have terrified/charmed pretty much anyone you decided to pick up in your sweet, Electric Hand-equipped Terraplane. 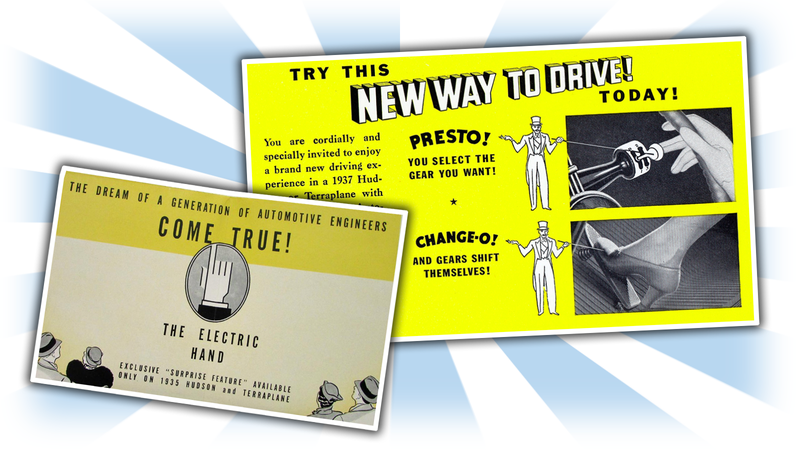 The Electric Hand is interesting in the development of automatic transmissions in that it only sought to replace the actual business of physically selecting the gears directly via the muscle in your arm rather than doing anything really automatically. I mean, it’s really not so much an automatic transmission as it is an assisted manual transmission—the driver still shifts gears, just via an adorable little gated shifter on a column, and the clutch is still used to actuate the shift. The gears are shifted via a hydraulic unit controlled by a series of electrical contacts and solenoids. Sometimes this system is called a ‘preselector’ transmission, because you first select your gear with the little thumb-shifter, then you engage the clutch, at which point the hydraulic system physically selects the gear. This is sort of the opposite approach to something like the Volkswagen/Porsche semi-automatic transmissions from the 1960s and 1970s, where there was no clutch pedal (the clutch being automatically actuated) but the driver still shifted the gears with their arm and a lever. I love the Electric Hand; it’s a pretty wildly complex solution that really just relocates the act of shifting and scales the physical inputs down from arm-power levels to finger-power. Sure, you get more floor space, but a column-shift does that too, with a lot less wires and solenoids and hydraulics. And you still have to shift and push the clutch pedal. So you don’t really get all that much benefit. Even so, I think it all becomes worth it if you give up the floor space to leave the shifter in place and enjoy the illusion of having a ghost dedicated to shifting your gears.